This article is about the railway line in England that is currently under construction. For the precursor service introduced in 2015, see TfL Rail. For other uses, see Crossrail (disambiguation). Crossrail, named the Elizabeth line, is a 73-mile (117-kilometre) railway line in England, which crosses London from Berkshire and Buckinghamshire in the west to Essex in the east. At each end of the central core, the line will divide into two branches: to the west, to stations at London Heathrow Airport and Reading; to the east, to Abbey Wood and Shenfield. In May 2015, a section of one of the eastern branches, between Liverpool Street and Shenfield, was transferred to TfL Rail; this precursor also took control of Heathrow Connect in May 2018. The project was approved in 2007 and construction began in 2009 on the central section and connections to existing lines that will become part of the route. Estimated to cost £15.4 billion, in December 2018 it was announced that the project would require a £1.4 billion bailout . A main feature is 13 miles (21 km) of twin tunnels below the city running from Paddington to Stratford and Canary Wharf. An almost entirely new line will branch from the main line at Whitechapel to Canary Wharf in part under the River Thames with a new station at Woolwich and connecting with the North Kent Line at Abbey Wood. New nine-carriage Class 345 trains will run at frequencies in the central section of up to 24 trains per hour in each direction. It is expected to relieve pressure on existing east-west London Underground lines such as the Central and District lines, as well as the Jubilee line extension and the Heathrow branch of the Piccadilly line. Crossrail will be operated by MTR Corporation (Crossrail) Ltd as a London Rail concession of Transport for London, in a similar manner to London Overground. TfL's annual ticket revenues for the project are forecast to exceed £800 million per year in 2020/21 and over £900 million per year from 2022/23. In August 2018, the scheduled opening of the core Elizabeth line was postponed from December 2018 to autumn 2019. In December 2018, executives were unwilling to give a firm opening date at the same time announcing additional funding to complete remaining works. The revised opening of the Elizabeth line to autumn 2019 has been delayed to late 2020 - early 2021. The concept of large-diameter tunnels crossing central London to connect Paddington in the west and Liverpool Street in the east was first proposed by railwayman George Dow in The Star newspaper in June 1941. The project that became Crossrail has origins in the 1943 County of London Plan and 1944 Greater London Plan by Patrick Abercrombie. These led to a specialist investigation by the Railway (London Plan) Committee, appointed in 1944 and reporting in 1946 and 1948. The term "Crossrail" emerged in the 1974 London Rail Study Report. Although the idea was seen as imaginative, only a brief estimate of cost was given: £300 million. A feasibility study was recommended as a high priority so that the practicability and costs of the scheme could be determined. It was also suggested that the alignment of the tunnels should be safeguarded[non-primary source needed] while a final decision was taken. The Central London Rail Study of 1989 proposed tunnels linking the existing rail network as the "East–West Crossrail", "City Crossrail", and "North–South Crossrail" schemes. The east–west scheme was for a line from Liverpool Street to Paddington/Marylebone with two connections at its western end linking the tunnel to the Great Western Main Line and the Metropolitan line on the Underground. The City route was shown as a new connection across the City of London linking the Great Northern Route with London Bridge. The north–south line proposed routing West Coast Main Line, Thameslink, and Great Northern trains through Euston and King's Cross/St Pancras, then under the West End via Tottenham Court Road, Piccadilly Circus and Victoria towards Crystal Palace and Hounslow. The report also recommended a number of other schemes including a "Thameslink Metro" route enhancement, and the Chelsea–Hackney line. The cost of the east–west scheme including rolling stock was estimated at £885 million. In 1991 a private bill was submitted to Parliament for a scheme including a new underground line from Paddington to Liverpool Street. The bill was promoted by London Underground and British Rail, and supported by the government; it was rejected by the Private Bill Committee in 1994 on the grounds that a case had not been made, though the government issued "Safeguarding Directions", protecting the route from any development that would jeopardise future schemes. In 2001 Cross London Rail Links (CLRL), a joint-venture between TfL and the DfT, was formed to develop and promote the Crossrail scheme, and also a Wimbledon–Hackney scheme. While CLRL was promoting the Crossrail project, alternative schemes were being proposed. In 2002 GB Railways put forward a scheme called SuperCrossRail which would link regional stations such as Cambridge, Guildford, Oxford, Milton Keynes Central Southend Victoria and Ipswich via a west-east rail tunnel through central London. The tunnel would follow an alignment along the River Thames, with stations at Charing Cross, Blackfriars and London Bridge. In 2004 another proposal named Superlink was promoted by a group of senior railway managers. Like SuperCrossRail, Superlink envisaged linking a number of regional stations via a tunnel through London, but advocated the route already safeguarded for Crossrail. CLRL evaluated both proposals and rejected them due to concerns about network capacity and cost issues. The Crossrail Act 2008 was given royal assent in July 2008, giving CLRL the powers necessary to build the line. Construction began on 15 May 2009. In September 2009 the project received £1 billion in funding. The money was lent to TfL by the European Investment Bank. Both the Labour and Conservative parties made commitments in their manifestos for the 2010 election to deliver the railway, and the coalition government formed after the election also committed to the project. The original schedule was that the first trains would run in 2017, but in 2010 the government delayed this to 2018 in order to save £1 billion. 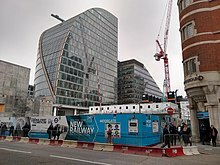 On 15 May 2009, construction began at Canary Wharf station. At the end of August 2018, four months before the scheduled opening of the core section of the Elizabeth line, it was announced that completion is delayed and that the line would not open before Autumn 2019. Crossrail's central core section will use new east–west twin tunnels under central London, splitting into two branches at either end. The tunnelled sections will be approximately 22 kilometres (14 mi) in length. In the east, the line splits at Whitechapel, with one branch running over the existing Great Eastern Main Line via Stratford to Shenfield, and the other branch running through Canary Wharf and emerging from the tunnel at Custom House on a disused part of the North London Line, continuing under the River Thames to Abbey Wood. In the west the route connects with the Great Western Main Line at Paddington and runs to Hayes and Harlington, where it splits. One branch runs to Heathrow Central (for Terminals 2 and 3), Heathrow Terminal 4 and Heathrow Terminal 5, while the other runs over the existing main line to Reading. The main western section runs on the surface from Reading to Acton Main Line. Upgrades are being made to stations at Maidenhead, Taplow, Burnham, Slough, Langley, Iver, West Drayton, Hayes & Harlington, Southall, Hanwell, West Ealing, Ealing Broadway and Acton Main Line. A "dive-under" was constructed at Acton to allow passenger trains to pass slower freight trains leaving and entering a goods yard. It was completed in July 2016 and was brought into use in 2017. 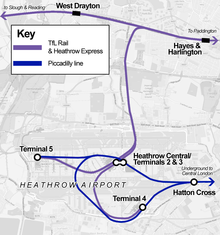 The Heathrow spur has three stations, at Heathrow Central (for Terminals 2 and 3), Terminal 4 and Terminal 5, and joins the main route at Airport Junction, between West Drayton and Hayes and Harlington. Construction of a flyover near Hayes & Harlington station began in 2014, and will allow Heathrow Express trains to pass over the track used by Crossrail, avoiding delays caused by crossings. Crossrail had been planned to terminate at Maidenhead, with an extension to Reading safeguarded. On 27 March 2014, however, it was announced that the line would indeed extend to Reading. The central tunnels run from a portal just west of Paddington to Whitechapel, with further tunnelling to Stratford and to Canary Wharf. There will be new stations at Paddington, Bond Street, Tottenham Court Road, Farringdon, Liverpool Street and Whitechapel, with interchanges with the London Underground and other National Rail services. Due to the size and positioning of the new platforms, Farringdon station will also be connected to Barbican station, and Liverpool Street to Moorgate station. Positioning a new station at Paddington presented structural design challenges due to its positioning just below Eastbourne Terrace and the station's taxi rank, and within 3 m (10 ft) of Isambard Kingdom Brunel's 150 year old mainline station. One of the two eastern sections runs underground from Whitechapel to Stratford, then on the surface on the existing main line. The service will replace the "Shenfield metro", with key stops at Ilford, Romford (for interchange with London Overground services to Upminster), Gidea Park (where some peak hour trains will start or terminate), and Shenfield. The other eastern branch runs underground from Whitechapel to Canary Wharf and Abbey Wood. It takes over the Custom House to Woolwich via Connaught Tunnel stretch of the former North London Line built by the Eastern Counties and Thames Junction Railway, and connects it with the North Kent Line via a tunnel under the Thames at North Woolwich. It will include a station at Woolwich. Efforts to connect Crossrail with London City Airport were not fruitful. Restoration of Connaught Tunnel by filling with concrete foam and reboring, as originally intended, was deemed too great a risk to the structural integrity of the tunnel, and so the docks above were drained to give access to the tunnel roof in order to enlarge its profile. This work took place during 2013. Crossrail is the name of the construction project and of the limited company, wholly owned by TfL, that was formed to carry out construction works. Since May 2015, rail services on future Crossrail route that are now managed by TfL are being operated under the temporary brand name of TfL Rail. Trains on the Paddington–Heathrow and Liverpool Street–Shenfield routes are painted with Crossrail livery and bear the TfL Rail logo, a Transport for London Roundel in TfL Blue, emblazoned with the TfL Rail name in white. Crossrail, rebranded as the Elizabeth line, is currently planned to come into full service with an east-west service across central London in late 2019. Rolling stock and signage on the Elizabeth line will use a version of the Transport for London roundel that will form part of the existing branding family of TfL roundel variants. 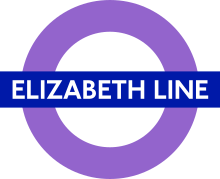 The Elizabeth line roundel will be coloured Pantone 266 purple crossed with a horizontal bar in TfL Blue (Pantone 072) emblazoned with the elizabeth line name in the corporate Johnston Underground typeface. There are five tunnelled sections, each with an internal diameter of 6.2 m (20 ft 4 in) (compared with 3.81 m (12 ft 6 in) for the deep-level Victoria line), totalling 21 km (13 mi) in length: a 6.4 km (4.0 mi) tunnel from near Royal Oak Underground station to Farringdon; an 8.3 km (5.2 mi) tunnel from Limmo Peninsula in Canning Town to Farringdon; a 2.7 km (1.7 mi) tunnel from Pudding Mill Lane near Stratford to Stepney Green; a 2.6 km (1.6 mi) tunnel from Plumstead to North Woolwich (Thames tunnel section); and a 0.9 km (0.6 mi) tunnel from Limmo Peninsula to the Victoria Dock portal which re-uses the Pudding Mill Lane to Stepney tunnelling machines. Each section consists of two tunnels excavated at the same time, with two tunnel boring machines (TBMs) per section. The tunnel linings are constructed from concrete sections, some of which are produced in Chatham Dockyard then transported by barge to the Limmo Peninsula. At the time, it was estimated that tunnelling would progress at 100 m (330 ft) per week. The main tunnelling contracts are valued at around £1.5 billion. The wide diameter tunnels allow for new Class 345 rolling stock, which is larger than the traditional deep-level tube trains. The tunnels allow for the emergency evacuation of passengers through the side-doors rather than along the length of the train. When bicycles are allowed to be carried it is regarded as essential to allow evacuation to the sides of the train. Crossrail has often been compared to Paris' RER system due to the length of the central tunnel. As well as nine new stations, Crossrail requires significant work on existing station infrastructure. Although initially the trains will be 200 metres (660 feet) long, platforms at the new stations in the central core are being built to enable 240 m (790 ft)-long trains in case of possible future extensions. At existing stations, platforms are being lengthened accordingly. In the eastern section, Maryland and Manor Park will not have platform extensions, so trains will use selective door opening instead. At Maryland this is because of the prohibitive cost of extensions and the poor business case, and at Manor Park it is due to the presence of a freight loop that would otherwise be cut off. A mock-up of the new stations was built in Bedfordshire to ensure that the architectural integrity would last for a century. It was planned to bring at least one mock-up to London for the public to view the design and give feedback before final construction commenced. Of the 40 stations, 32 will have step-free access to both platforms, and train doors will be level with the platforms at central stations and at Heathrow. The stations will be fully equipped with CCTV[non-primary source needed] and, due to the length of the platforms, train indicators will be above the platform-edge doors in central stations. It was announced on 5 July 2017 that Crossrail services would be extended to Heathrow Terminal 5 from December 2019, meaning that all Heathrow terminals will have a Crossrail service when the full service commences in December 2019. Crossrail will operate using the new Class 345 trains. These are currently being used on the two interim TfL rail branches that will later become part of the Elizabeth Line when it first opens in mid 2019. The requirement is for 65 trains, each 200 metres (660 feet) long and carrying up to 1,500 passengers. The trains will be accessible, including dedicated areas for wheelchairs, with audio and visual announcements, CCTV and speaker-phones connected to the driver in case of emergency. Crossrail has stated that the new trains will be based on existing designs to minimise costs associated with development. They will run at up to 140 km/h (90 mph) on certain parts of the route. In March 2011, Crossrail announced that five bidders had been shortlisted for the contract to build the Class 345 and its associated depot. One of the bidders, Alstom, withdrew from the process in July 2011. In February 2012, Crossrail issued an invitation to negotiate to CAF, Siemens, Hitachi and Bombardier, with tenders expected to be submitted by mid-2012. In 2013, Siemens also withdrew from the bid, but will provide signalling and control systems for Crossrail. In February 2014, Transport for London and the Department for Transport announced that the contract to build and maintain the new rolling stock had been awarded to Bombardier. The contract covers the supply, delivery and maintenance of 65 new trains and a depot at Old Oak Common. The trains are being built at Bombardier's Derby Litchurch Lane Works. This contract will support around 760 UK manufacturing jobs plus 80 apprenticeships. An estimated 74 per cent of contract spend is expected to remain in the UK economy. The design will be based on Bombardier's Aventra design. The first Class 345 train entered service on 22 June 2017 and they are notable in that they are the first mainline trains in Britain since 1962 to not have a yellow warning panel of any kind painted on the driving ends. On 17 December 2018, TfL revealed plans to sell, and lease back, the new Elizabeth Line trains to raise money for new Piccadilly Line trains. The proposed buyer is Rock Rail. The scheme has been criticized by London Assembly member Caroline Pidgeon. Crossrail will use 25 kV, 50 Hz AC overhead lines, as on the Great Eastern Main Line and the Great Western Main Line as far as Airport Junction. Overhead electrification has been installed between Airport Junction and Didcot Parkway as part of the 21st-century modernisation of the Great Western Main Line (GWML upgrade), but Crossrail will only use it as far as Reading. Crossrail will have two depots, in west London at Old Oak Common and in east London at a new signalling centre at Romford. In April 2009, Crossrail announced that 17 firms had secured 'Enabling Works Framework Agreements' and would now be able to compete for packages of works. At the peak of construction up to 14,000 people were expected to be needed in the project's supply chain. Work began on 15 May 2009 when piling works started at the future Canary Wharf station. The threat of diseases being released by work on the project was raised by Lord James of Blackheath at the passing of the Crossrail Bill. He told the House of Lords select committee that 682 victims of anthrax had been brought into Smithfield in Farringdon with some contaminated meat in 1520 and then buried in the area. On 24 June 2009 it was reported that no traces of anthrax or bubonic plague had been found on human bone fragments discovered during tunnelling. Invitations to tender for the two principal tunnelling contracts were published in the Official Journal of the European Union in August 2009. 'Tunnels West' (C300) was for twin 6.2 kilometres (3.9 mi)-long tunnels from Royal Oak through to the new Crossrail Farringdon Station, with a portal west of Paddington. The 'Tunnels East' (C305) request was for three tunnel sections and 'launch chambers' in east London. [non-primary source needed] Contracts were awarded in late 2010: the 'Tunnels West' contract was awarded to BAM Nuttall, Ferrovial Agroman and Kier Construction (BFK); the 'Tunnels East' contract was awarded to Dragados and John Sisk & Son. The remaining tunnelling contract (C310, Plumstead to North Woolwich), which included a tunnel under the Thames, was awarded to Hochtief and J. Murphy & Sons in 2011. 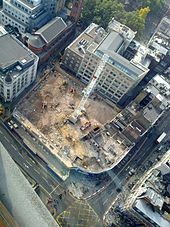 By September 2009, preparatory work for the £1 billion developments at Tottenham Court Road station had begun, with buildings (including the Astoria Theatre) being compulsorily purchased and demolished. In March 2010, contracts were awarded to civil engineering companies for the second round of 'enabling work' including 'Royal Oak Portal Taxi Facility Demolition', 'Demolition works for Crossrail Bond Street Station', 'Demolition works for Crossrail Tottenham Court Road Station' and 'Pudding Mill Lane Portal'. In December 2010, contracts were awarded for most of the tunnelling work. To assist with the skills required for the Crossrail project, Crossrail Ltd opened in 2011 the Tunnelling and Underground Construction Academy in Ilford. The Academy was handed over to Transport for London in 2017, who have sub contracted its management to PROCAT. In February 2010, Crossrail was accused of bullying residents whose property lay on the route into selling for less than the market value. A subsequent London Assembly report was highly critical of the insensitive way in which Crossrail had dealt with compulsory purchases and the lack of assistance given to the people and businesses affected. There were also complaints from music fans, as the London Astoria was forced to close. In December 2011, a contract to ship the excavated material from the tunnel to Wallasea Island was awarded to a joint venture comprising BAM Nuttall Limited and Van Oord UK Limited. [non-primary source needed] Between 4.5 and 5 million tonnes of soil will be used to construct a new wetland nature reserve (Wallasea Wetlands). The project eventually moved seven million tons of earth. Boring of the railway tunnels was officially completed at Farringdon on 4 June 2015 in the presence of the Prime Minister and the Mayor of London. Installation of the track was completed in September 2017. The ETCS signalling was scheduled to be tested in the Heathrow tunnels over the winter of 2017/18. The south east section of the infrastructure was energised in February 2018, with the first test train run between Plumstead and Abbey Wood that month. In May 2018 the overhead lines were powered up between Westborne Park and Stepney and the installation of platform doors was completed, and video was released of the first trains traveling through the tunnels. TfL Rail took over Heathrow Connect services from Paddington to Heathrow in May 2018. The infrastructure will be handed over to TfL in summer 2018, so that they can start trial operations to ensure the reliability of the service. The project used eight 7.1-metre (23-foot) diameter tunnel-boring machines (TBM) from Herrenknecht AG (Germany). Two types are used; 'slurry' type for the Thames tunnel, which involves tunnelling through chalk; and 'Earth Pressure Balance Machines' (EPBM) for tunnelling through clay, sand and gravel (at lower levels through Lambeth Group and Thanet Sands ground formation). The TBMs weigh nearly 1,000 tonnes and are over 100 metres (330 feet) long. 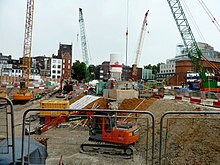 The Tottenham Court Road construction site (2009). This included the former site of the London Astoria music venue. In 2012 Crossrail faced accusations and evidence of blacklisting. An industrial relations manager Ron Barron, employed by Bechtel, had routinely cross-checked job applicants against the Consulting Association database. An employment tribunal in 2010 had heard that he introduced the use of the blacklist at his former employer, the construction firm Chicago Bridge & Iron Company (CB&I), and referred to it more than 900 times in 2007 alone. He was found to have unlawfully refused employment to a Philip Willis, with aggravated damages awarded because Barron had added information about Willis to the blacklist. In May 2012, a BFK manager challenged their subcontractor, Electrical Installations Services Ltd. (EIS), saying that one of their electricians was a trade union activist. Some days later, Pat Swift, the HR manager for BFK and a regular user of the Consulting Association, again challenged EIS. EIS refused to dismiss their worker and lost the contract. Flash pickets were held at the Crossrail site and also at the sites of the BFK partners. The Scottish Affairs Select Committee called on the UK Business Secretary, Vince Cable, to set up a government investigation into blacklisting at Crossrail. The electrician was reinstated. Further allegations of blacklisting against Crossrail were made in Parliament in September 2017. In September 2012, a gantry supporting a spoil hopper at a construction site near Westbourne Park Underground station, used to load rail wagons with excavated waste, collapsed, tipping sideways and causing the adjacent Network Rail line to be closed. On 7 March 2014, Rene Tkacik, a Slovakian construction worker, was killed by a piece of falling concrete while working in a tunnel. In April 2014, The Observer reported details of a leaked internal report, compiled for the Crossrail contractors by an independent safety consultancy. The report was claimed to indicate poor industrial relations over safety issues and that workers were "too scared to report injuries for fear of being sacked". Roman coins and a Roman medallion found at Liverpool Street which was issued to mark the New Year celebrations in AD 245. This medallion was only the second ever of its kind to be found in Europe. 13,000 Crosse & Blackwell jars found near Tottenham Court Road from the late 19th and early 20th centuries. Once fully opened, the Elizabeth line will run a familiar London Underground-style all-stops service in the central core section and eastern branches, but initial timetable plans suggest that several trains on the western branches will run semi-fast. Initial proposals suggest Acton Main Line and Hanwell will be served only by Heathrow-bound trains. Like the outer sections of Thameslink, the Elizabeth line will share platforms and tracks with other services outside the tunnelled sections. Some run by other train companies will continue to call at various stations on the Great Western main line branch, and Heathrow Express will continue to run between Paddington and Heathrow stations. Approximately half of all Elizabeth line westbound trains, those from Shenfield via Stratford, are expected to terminate at Paddington during peak hours. The eastern section via Stratford is expected to see an additional four trains per hour (tph) during peak times between Gidea Park and the existing main line Liverpool Street station's high level terminating platforms. Since these trains run over existing above-ground lines from Liverpool Street to Stratford, they will not call at Whitechapel. Before the main tunnels under central London are opened, it is planned to transfer passenger operations on the outer branches of the Crossrail system to TfL for inclusion in the Crossrail concession. This transfer took place over several stages beginning May 2015. During this initial phase of operation, services are being operated by MTR under the TfL Rail brand. Following the practice adopted during the transfer of former Silverlink services to London Overground in 2007, TfL will carry out a deep clean of stations and trains on the future Elizabeth line route, install new ticket machines and barriers, introduce Oyster card and contactless payment, and ensure all stations are staffed. Existing rolling stock has been rebranded with the TfL Rail identity. London's transport authority, Transport for London, have confirmed that the crisis-hit Crossrail project will not open until at least the middle of 2020. Ticketing is intended to be integrated with the other London transport systems, and Oyster pay as you go will be accepted. Travelcards and concessionary passes will be valid within Greater London. Just as TfL Rail current replacement of Heathrow Connect, trips to or from Heathrow Airport will be priced at a premium for single fares for the additional cost of using the rail tunnel between Heathrow Airport and Hayes & Harlington, but will be included within travelcards and daily/weekly fare capping as a Zone 6 station. Crossrail will be integrated with the Underground and National Rail networks, and it is planned to include it on the standard London Underground Map. Crossrail has predicted annual passenger numbers of 200 million from its opening in late 2018; this is expected to relieve pressure on London Underground's lines, especially the Central line. Farringdon is expected to become one of the busiest stations in the UK, due to it being the key interchange station with the North–South Thameslink route. Once Crossrail is fully open, TfL expects passenger revenue of over £800 million per year in 2020/21 and over £900 million per year from 2022/23. The opening of the new Crossrail station will reduce the journey times from Woolwich, taking 8 minutes to Canary Wharf, 21 m to Bond Street and 47 m to Heathrow. The construction of a station at Woolwich was not proposed as part of the original Crossrail route. The House of Commons Select Committee recognised its inclusion in March 2007. When Crossrail becomes operational, the new station located on the southeast section of the route will see up to 12 trains an hour. It will run during peak hours, connecting south-east London and the Royal Docks with Canary Wharf, central London and beyond. The Woolwich station is being built on the southeast portion of the Crossrail line that ends at Abbey Wood. The Woolwich redevelopment site at Royal Arsenal is a waterside housing and retail development area adjacent to the Woolwich station. It is spread across approximately 30 ha (74 acres) of land and is being developed by Berkeley Homes. The site is being developed with the construction of approximately 2,517 new homes, in addition to the 1,248 homes already built. The area also includes a new heritage quarter along with the Greenwich Heritage Centre and Royal Artillery Museum, as well as infrastructural developments such as retail stores, restaurants and cafés, offices, hotels and a cinema. As part of the former Labour government's plans for the High Speed 2 rail link from London to Birmingham, a Crossrail-High Speed 2 interchange would be built at Old Oak Common (between Paddington and Acton Main Line stations). This would be built as part of High Speed 2 (which would start construction, under Labour's plans, in 2017), so would not be built in the first phase of Crossrail. It would provide interchange to other mainline and TfL lines. The succeeding Conservative-Liberal Democrat government adopted that proposal in the plans it put forward for public consultation. This means it is likely to go forward as part of High Speed 2, potentially giving Crossrail an interchange with High Speed 2, the Great Western Main Line (GWML), Central line and London Overground services running through the area. Although the Crossrail route passes very close to London City Airport, there will not be a station serving the airport directly. London City Airport has proposed the re-opening of Silvertown railway station, in order to create an interchange between the rail line and the airport. The self-funded £50m station plan is supported 'in principle' by the London Borough of Newham. Provisions for re-opening of the station were made in 2012 by Crossrail. However, it is alleged by the airport that Transport for London is hostile to the idea of a station on the site, a claim disputed by TfL. In 2018, the airport's chief development officer described the lack of a Crossrail station as a "missed opportunity", but did not rule out a future station for the airport. The CEO stated in an interview that a station is not essential to the airport's success. According to the original plans, Maidenhead was planned to be the western terminus of Crossrail. Various commentators advocated an extension further west as far as Reading because it was seen as complementary to the Great Western Electrification project which was announced in July 2009. A Reading terminus was also recommended by Network Rail's 2011 Route Utilisation Strategy. The Conservative MP for Reading East, Rob Wilson, expressed concerns that Crossrail trains (which will call at every station) will actually be slower than the present Reading-Paddington service. According to Wilson, "We need the right Crossrail, not any Crossrail". Most existing fast services between Reading and Paddington would remain after the introduction of Crossrail because there are only paths for the additional two services per hour which the latter will provide. Network Rail's July 2011 London & South East Route Utilisation Strategy (RUS) recommended that a short railway line could be built to connect the West Coast Main Line (WCML) with the Crossrail route. This would enable train services that currently run between Milton Keynes Central and London Euston to be re-routed via Old Oak Common to serve central London, Shenfield and Abbey Wood. The report argued that this would free up capacity at Euston for the planned High Speed 2, reduce London Underground congestion at Euston, make better use of Crossrail's capacity west of Paddington, and improve access to Heathrow Airport from the north. Under this scheme, all Crossrail trains would continue west of Paddington, instead of some of them terminating there. They would serve Heathrow Airport (10 tph), stations to Maidenhead and Reading (6 tph), and stations to Milton Keynes Central (8 tph). In August 2014, a statement by transport secretary Patrick McLoughlin indicated that the government was actively evaluating the extension of Crossrail as far as Tring, with potential Crossrail stops at Wembley Central, Harrow & Wealdstone, Bushey, Watford Junction, Kings Langley, Apsley, Hemel Hempstead and Berkhamsted. The extension would relieve some pressure from London Underground and London Euston station while also increasing connectivity. Conditions to the extension were that any extra services should not affect the planned service pattern for confirmed routes, as well as affordability. This proposal was shelved in August 2016 due to "poor overall value for money to the taxpayer". The route to Gravesend has been safeguarded by the Department for Transport, although it was made clear that as at February 2008 there was no plan to extend Crossrail beyond the then-current scheme. The following stations are on the protected route extension to Gravesend: Belvedere, Erith, Slade Green, Dartford, Stone Crossing, Greenhithe for Bluewater, Swanscombe, Northfleet, and Gravesend. In January 2018 it was revealed that the Mayor of London, Sadiq Khan, had included an extension of Crossrail to Ebbsfleet as part of a transport plan between 2021 and 2041. TfL stated that they were considering an extension to Ebbsfleet. The RUS also proposes integrating Heathrow Express services from Heathrow Terminal 5 into Crossrail to relieve the GWML and reduce the need for passengers to change at Paddington. As part of the Heathrow Southern Railway scheme proposed in 2017, the western extent of the Crossrail route could be extended beyond Heathrow Airport to terminate at Staines. This extension would form part of a wider scheme to create new rail links in west London and Surrey serving Heathrow, and would require the construction of an extra platform at Staines station. This proposal has not been approved or funded. Major landowners Canary Wharf Group, Heathrow Airport Holdings, and Berkeley Homes. Crossrail is being built by Crossrail Ltd, jointly owned by Transport for London and the Department for Transport until December 2008, when full ownership was transferred to TfL. Crossrail has a £15.9 billion funding package in place for the construction of the line. Although the branch lines to the west and to Shenfield will still be owned by Network Rail, the tunnel will be owned and operated by TfL. On 18 July 2014, TfL London Rail said that MTR Corp had won the concession to operate the services for eight years, with an option for two more years. The concession will be similar to London Overground. [non-primary source needed] It is planned for the franchise to run for eight years from May 2015, taking over control of Shenfield metro services from Abellio Greater Anglia in May 2015, and Reading / Heathrow services from Great Western Railway in 2018. In anticipation of an May 2015 transfer of Shenfield to Liverpool Street services from the Greater Anglia franchise to Crossrail, the invitation to tender for the 2012–2013 franchise required the new rail operator to set up a separate "Crossrail Business Unit" for those services before the end of 2012. This unit was to allow transfer of services to the new Crossrail Train Operating Concession (CTOC) operator during the next franchise. Crossrail 2 – second proposed Crossrail route, running north east to south west. ^ "TfL Rail: What we do". Transport for London. Archived from the original on 25 May 2015. Retrieved 10 December 2018. ^ a b c "CROSSRAIL LTD OUTLINES PLAN TO COMPLETE THE ELIZABETH LINE" (Press release). Crossrail. 25 April 2019. ^ a b c d e "MTR selected to operate Crossrail services". Railway Gazette International. 18 July 2014. ^ a b "Bombardier wins Crossrail train contract". Railway Gazette International. 6 February 2014. ^ a b Jobson, Robert (23 February 2016). "Crossrail named the Elizabeth line: Royal title unveiled as the Queen visits Bond Street station". London Evening Standard. Retrieved 23 February 2016. ^ Thomas, Nathalie (26 August 2013). "Going underground on Crossrail: A 40-year project is taking shape". The Telegraph. ^ "Crossrail running £600m over budget". BBC News. 24 July 2018. Retrieved 28 July 2018. ^ "delayed Crossrail". 15 January 2019. Retrieved 1 April 2019. ^ "42 kilometres of new rail tunnels under London". Crossrail. 2013. Retrieved 18 March 2013. ^ a b "Transport for London Business Plan" (PDF). Transport for London. December 2017. p. 87. Archived from the original (PDF) on 29 April 2018. Retrieved 29 April 2018. ^ Dow, Andrew (2005). Telling the Passenger Where to Get Off. London: Capital Transport. pp. 52–55. ISBN 978-1-85414-291-7. ^ Jackson, Alan A.; Croome, Desmond F. (1962). Rails Through The Clay. London: Allen & Unwin. pp. 309–312. OCLC 55438. ^ "Safeguarding". Crossrail. n.d. Retrieved 6 July 2013. ^ British Rail (Network SouthEast); London Regional Transport; London Underground (January 1989). "Central London Rail Study". Department of Transport. pp. 11–16, maps 3, 6 & 7. ^ "Crossrail". Hansard. 20 June 1994. ^ "Select Committee on the Crossrail Bill : 1st Special Report of Session 2007–08: Crossrail Bill" (PDF). 1: Report. House of Lords. Chapter 1: Introduction: The History of Crossrail, page 8. ^ "Rival cross-city rail plan aired". BBC News. 15 December 2004. Archived from the original on 29 May 2018. Retrieved 29 May 2018. ^ Landels, John (24 May 2005). "SuperCrossrail and Superlink Update Report" (PDF). Cross London Rail Links Limited. Archived from the original (PDF) on 18 October 2007. Retrieved 13 September 2018. ^ "Crossrail Bill 2005". Crossrail. Archived from the original on 3 August 2009. Retrieved 30 December 2009. ^ "Soho shops make way for Crossrail". BBC News. 13 November 2009. ^ "Crossrail gets £230m BAA funding". BBC News. 4 November 2008. Retrieved 26 March 2010. ^ Hill, Dave (15 May 2009). "Work on London's £16bn Crossrail scheme begins". The Guardian. Retrieved 30 December 2009. ^ "Crossrail project gets £1bn loan". BBC News. 7 September 2009. ^ "New coalition government makes Crossrail pledge". BBC News. 15 April 2010. Retrieved 19 May 2010. ^ "Mayor secures vital London transport investment and protects frontline services" (Press release). Transport for London. 20 October 2010. Archived from the original on 17 August 2012. ^ a b Gerrard, Neil (15 May 2009). "Work officially starts on Crossrail". Contract Journal. Archived from the original on 17 May 2009. ^ "Crossrail to miss December opening date". BBC News. 31 August 2018. Archived from the original on 14 September 2018. Retrieved 14 September 2018. ^ a b Heathrow Media Centre (4 July 2017). "New agreement to boost Heathrow rail services". Retrieved 25 August 2017. ^ a b c "London Crossrail plans extended to Reading". BBC News. 27 March 2014. Retrieved 27 March 2014. ^ a b c "Crossrail extended to Reading". Department for Transport. Retrieved 27 March 2014. ^ "New train underpass at Acton reaches structural completion". Archived from the original on 29 December 2016. ^ "Network Rail completes £100m of upgrades over Christmas". ^ "First Crossrail tracks laid on Stockley Flyover bridge". BBC News. 24 November 2014. Retrieved 14 May 2017. ^ "SAFEGUARDING DIRECTIONS FOR DEVELOPMENT AFFECTING THE ROUTE AND ASSOCIATED WORKS PROPOSED FOR THE CROSSRAIL PROJECT – MAIDENHEAD TO OLD OAK COMMON, OLD OAK COMMON TO ABBEY WOOD, STRATFORD TO SHENFIELD AND WORKS AT WEST HAM, PITSEA AND CLACTON-ON-SEA" (PDF). ^ a b "DfT and TfL extend Crossrail route to Reading" (Press release). Transport for London. 27 March 2014. ^ "London City Airport Consultative Committee – Surface Access". Archived from the original on 16 May 2016. Retrieved 27 May 2016. ^ "Crossrail team gain confidence". Modern Railways. July 2012. p. 37. ^ a b Smith, Howard. "Crossrail – Moving to the Operating Railway Rail and Underground Panel 12 February 2015" (PDF). 12 February 2015. Transport for London. Archived (PDF) from the original on 13 February 2015. Retrieved 13 February 2015. ^ "About Crossrail Ltd". Crossrail. Archived from the original on 14 September 2018. Retrieved 14 September 2018. ^ Matters, Transport for London. "TfL Rail". Transport for London. Archived from the original on 25 May 2015. Retrieved 14 September 2018. ^ "Colour Standards" (PDF). Transport for London. Retrieved 14 September 2018. ^ "Elizabeth line Design Idiom" (PDF). Transport for London. 6 December 2017. Archived from the original (pdf) on 14 September 2018. Retrieved 14 September 2018. Thomas, Tris (22 September 2011). "Herrenknecht supply final Crossrail TBMs". Tunneling Journal. ^ "Crossrail awards remaining tunnelling contracts as Crossrail's momentum becomes unstoppable" (PDF) (Press release). Crossrail. 7 April 2011. Archived from the original (PDF) on 29 April 2011. ^ Crossrail Bill: 1st Special Report of Session 2007–08, Vol. 2: Evidence. The Stationery Office. 19 August 2008. pp. 148–150. ISBN 978-0-10-401354-0. ^ DVV Media UK (13 March 2009). "London's cross-city line follows the RER model". Railway Gazette. Retrieved 2 June 2017. ^ May, Jack (11 January 2017). "To RER A, or to RER C? How Paris typifies the two models for cross-city commuter train lines". CityMetric. Retrieved 2 June 2017. ^ a b Hyde, John (16 March 2011). "Crossrail 'mock-ups' for stations that will last 100 years" Archived 6 October 2011 at the Wayback Machine. Docklands 24. ^ Nicholls, Matt (11 April 2011). "Forest Gate station Crossrail design work contract awarded". Newham Recorder. ^ "House of Lords Select Committee on the Crossrail Bill: Minutes of Evidence". UK Parliament. 27 May 2008. ^ "House of Lords Select Committee on the Crossrail Bill: Minutes of Evidence (Questions 1060–1079)". UK Parliament. 27 May 2008. ^ a b "Future of London transport revealed at secret site". BBC News. 16 March 2011. ^ "Crossrail Route Map". Crossrail. Crossrail. Retrieved 27 March 2014. ^ a b "Crossrail demonstrates commitment to disability equality" (Press release). Crossrail. 21 September 2009. Archived from the original on 28 October 2012. Retrieved 16 March 2011. ^ "Crossrail Extending To Heathrow Terminal 5". Londonist. 5 July 2017. Retrieved 13 July 2017. ^ a b "Crossrail rolling stock and depot contract to be awarded to Bombardier" (Press release). Department for Transport. 6 February 2014. Retrieved 6 February 2014. ^ "Crossrail outlines progress on delivering value for money" (Press release). Crossrail. 27 September 2010. Retrieved 9 July 2011. ^ "Crossrail trains take shape". Crossrail. Crossrail. Retrieved 14 November 2015. ^ "Crossrail issues rolling stock shortlist". Railway Gazette International. 30 March 2011. ^ "Crossrail rolling stock contract invitations to negotiate issued". Railway Gazette International. 28 February 2012. ^ "Siemens withdraws from Crossrail bid". BBC News. 5 July 2013. Retrieved 6 July 2013. ^ "Bombardier wins £1bn Crossrail deal". BBC News. 6 February 2014. Retrieved 6 February 2014. ^ News (22 June 2017). "First Elizabeth line train enters passenger service". ^ "Now it's 2019: Crossrail's stealth delay". BorisWatch (blog). 8 June 2011. ^ "Crossrail starts tender process for signalling system" (Press release). Crossrail. 14 April 2011. ^ "Crossrail Rolling Stock Tender is Issued". London Reconnections (blog). 1 December 2010. ^ "Could we finally see the end of overcrowded trains?". BBC News. Retrieved 29 May 2016. ^ "Route Window NE9 Romford station and depot (east)" (PDF). Crossrail. Retrieved 26 May 2016. ^ Owen, Ed (9 April 2009). "Crossrail enabling works frameworks announced". New Civil Engineer. EMap. Retrieved 28 May 2014. ^ "Careers". Crossrail. Retrieved 9 March 2012. ^ "Crossrail pledges 14,000 jobs boom for Londoners". London Evening Standard. 11 October 2007. Retrieved 28 May 2014. ^ "House of Lords – Crossrail Bill Examination of Witnesses (Questions 12705–12719)". UK Parliament. 2008. Retrieved 24 June 2009. ^ "No anthrax in Crossrail remains". BBC News. 24 June 2009. Retrieved 24 June 2009. ^ "Crossrail tunnelling contracts advertised" (Press release). Crossrail. 25 August 2009. Retrieved 9 March 2012. ^ "Crossrail awards major tunnelling contracts worth £1.25bn" (Press release). Crossrail. 10 December 2010. ^ "Crossrail tunnel factory in Kent at full production". BBC News. 16 April 2013. Retrieved 28 May 2014. ^ "Hochtief and Vinci win last Crossrail tunnels". The Construction Index. 4 August 2011. ^ "Crossrail station profile: Tottenham Court Road". New Civil Engineer. 24 September 2009. Retrieved 30 December 2009. ^ "Crossrail to awards second round of enabling contracts". New Civil Engineer. 16 March 2010. Retrieved 17 March 2010. ^ "Crossrail awards tunnelling contracts". Railway Gazette International. 13 December 2010. Retrieved 13 December 2010. ^ "TfL takes on TUCA – Tunnelsonline.info p.23 March 2017". Retrieved 2 May 2017. ^ "Tunnelling academy's future secured – The Construction Index p.14 March 2017". Retrieved 2 May 2017. ^ Bar-Hillel, Mira (10 February 2010). "Boris Johnson takes on the 'bullies' evicting residents to make way for Crossrail". London Evening Standard. Retrieved 10 February 2010. ^ "Light at the end of the tunnel". London Assembly. 23 February 2010. Archived from the original on 14 March 2013. Retrieved 24 February 2010. ^ a b Carrington, Damian (17 September 2012). "Crossrail earth to help create biggest man-made nature reserve in Europe". The Guardian. Retrieved 15 March 2013. ^ "Crossrail awards contract to ship excavated material to Wallasea Island" (Press release). Crossrail. 16 December 2011. ^ "Monster lift sends east London tunnelling machines 40 metres underground". Crossrail. 2013. Retrieved 7 January 2013. ^ Morelle, Rebecca (17 September 2012). "Wallasea Island nature reserve project construction begins". BBC News. Retrieved 15 March 2013. ^ "From railway to wildlife". The Telegraph. 3 March 2016. Retrieved 8 April 2016. ^ MacLennan, Peter (4 June 2015). "Prime Minister and Mayor of London celebrate completion of Crossrail's tunnelling marathon" (Press release). Crossrail. Retrieved 27 June 2015. ^ "ELIZABETH LINE PERMANENT TRACK INSTALLATION IS COMPLETE". ^ a b "Elizabeth Line Operational Readiness and Integration" (PDF). ^ "First Elizabeth line train tests through Crossrail Tunnels". Construction Manager Magazine. Retrieved 28 July 2018. ^ "Footage of train testing under London and new construction images highlight Elizabeth line progress". ^ Neild, Barry (25 May 2018). "First look at epic new Crossrail tunnel ride under London". CNN. Retrieved 27 May 2018. ^ "TfL takes over Heathrow Connect services in Elizabeth line milestone". www.railtechnologymagazine.com. "Bulletin: The giant burrowers" (PDF) (23). Crossrail. 2011. Archived from the original (PDF) on 14 October 2011. Symes, Claire (14 December 2011). "Crossrail's first TBM ready for delivery". New Civil Engineer. ^ "Names of our first six tunnel boring machines announced". Crossrail. 13 March 2012. ^ "Olympic champions join Crossrail's marathon tunnelling race". Crossrail. 16 August 2013. ^ a b Boffey, Daniel (2 December 2012). "Crossrail project dragged into blacklist scandal". The Guardian. Retrieved 5 May 2013. ^ Smith, Dave; Chamberlain, Phil (2015). Blacklisted The Secret War between Big Business and Union Activists. New Internationalist. ISBN 978-0-7453-3398-4. ^ Matthew Taylor (28 July 2013). "Construction industry blacklisting is unacceptable, warns Vince Cable". The Guardian. Retrieved 5 October 2015. ^ "Crossrail Blacklist Victory Party". Northern Voices. 21 September 2013. Retrieved 11 October 2015. ^ "Crossrail blacklisting aired in Parliament". The Construction Index. 6 September 2017. Retrieved 11 September 2017. ^ Lewis, Mark (28 September 2012). "Gantry collapse at Westbourne Park Crossrail site". Construction News. ^ Freeman, Simon (28 September 2012). "Waste hopper collapses at Paddington station". London Evening Standard. ^ "Slovakian identified as killed Crossrail worker". BBC News. 12 March 2014. Retrieved 27 April 2014. ^ Boffey, Daniel (27 April 2014). "Crossrail managers accused of 'culture of spying and fear'". The Observer. Retrieved 27 April 2014. ^ "About Tunnel: The Archaeology of Crossrail – Crossrail Archaeology Museum". ^ "Museum of London Docklands to reveal archaeological finds unearthed by the Crossrail project". crossrail.co.uk. ^ McDermott, Josephine (10 February 2017). "'A vignette of life in the past'". BBC News. ^ "Exhibition shows 8,000 years of human history found during Crossrail". Daily Mail. ^ Eleftheriou, Krista (15 March 2013). "14th century burial ground discovered in Central London" (Press release). Crossrail. Retrieved 18 March 2013. ^ "'Black Death' victims unearthed as Crossrail excavations reveal 12 Middle Ages skeletons". Metro. 15 March 2013. Retrieved 18 March 2013. ^ "Crossrail: Timetable for Success?". London Reconnections. 15 August 2018. Retrieved 16 August 2018. ^ "Elizabeth Line Service Pattern: Reading station to central London" (PDF). Crossrail. July 2017. Retrieved 16 August 2018. ^ "Elizabeth Line Service Pattern: Shenfield station to central London" (PDF). Crossrail. July 2017. Retrieved 16 August 2018. ^ a b "Subscribe to read". Financial Times. Retrieved 12 January 2019. ^ "Transport for London on Twitter". Twitter. 10 May 2018. Retrieved 14 May 2018. ^ "First Elizabeth line trains as Crossrail stage one launches next month". London Evening Standard. 30 April 2017. ^ "Crossrail in numbers". Crossrail. March 2016. ^ "Farringdon station". Crossrail. January 2017. ^ a b c d "Crossrail Woolwich Station". railway-technology.com. Kable. ^ a b "Woolwich station". Crossrail. ^ "Have your say on plans to transform Old Oak and Park Royal". London.gov.uk (Press release). London City Hall. 5 February 2016. Retrieved 14 July 2017. ^ "Transforming East London Together 2013–2023" (PDF). London City Airport. Archived from the original (PDF) on 26 January 2017. Retrieved 1 April 2018. ^ "Examination of the London Borough of Newham – Detailed Sites and Policies Development Plan Document – Written Statement of London City Airport" (PDF). London Borough of Newham. 11 April 2006. ^ "Silvertown Station – Crossrail Proposals" (PDF). Crossrail. 17 January 2012. Archived from the original (PDF) on 5 July 2015. ^ Broadbent, Giles (31 May 2016). "Why is TfL so hostile to a Crossrail station at LCY?". The Wharf. Mirror Group Newspapers. Retrieved 13 October 2016. ^ Horgan, Rob; Smale, Katherine. "London City Airport - Crossrail 'a missed opportunity'". New Civil Engineer. ^ "London City Airport CEO says Crossrail isn't essential to its success". InYourArea.co.uk. 12 February 2018. ^ Owen, Ed (23 July 2009). "Crossrail to Reading would keep it on track". New Civil Engineer. ^ "Britain's Transport Infrastructure – Rail Electrification" (PDF). Department for Transport. July 2009. Archived from the original (PDF) on 8 April 2010. ^ "Crossrail bid supported by Lord Adonis". Reading Post. 20 November 2013. Retrieved 5 December 2013. ^ "Rob campaigns for "New & Improved" Crossrail Service to Reading" (Press release). Rob Wilson MP. 22 November 2013. Archived from the original on 14 December 2013. Retrieved 5 December 2013. ^ "'Emerging scenario' suggests Crossrail to the West Coast Main Line". Rail. Peterborough. 10 August 2011. p. 8. 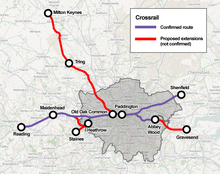 ^ "Crossrail extension to Hertfordshire being considered". BBC News. 7 August 2014. Retrieved 7 August 2014. ^ Topham, Gwyn (7 August 2014). "New Crossrail route mooted from Hertfordshire into London". The Guardian. Retrieved 12 August 2014. ^ "Crossrail off the tracks as plans are shelved". Hemel Today. Johnston Publishing. 5 August 2016. Retrieved 6 August 2016. ^ Harris, Tom (6 February 2008). "Crossrail Safeguarding Update 2008". Department for Transport. Archived from the original on 7 June 2009. Retrieved 16 February 2008. ^ "Crossrail Safeguarding Directions Abbey Wood to Gravesend and Hoo Junction (Volume 4)" (PDF). Retrieved 29 July 2016. ^ "'Important' Crossrail extension through Dartford listed as priority for government". News Shopper. ^ "Service Opportunities". Heathrow Southern Railway. 2017. Retrieved 3 March 2019. ^ "The future of Crossrail". House of Commons. 5 November 2007. ^ a b "Greater Anglia Franchise Invitation to Tender 21 April 2011" (PDF). Archived from the original (PDF) on 4 May 2011. ^ "Crossrail moves forward with major train and depot contract" (Press release). Crossrail. 1 December 2010. ^ "TfL Board Meeting Summary: DLR, Overground and Other Ways of Travelling". London Reconnections (blog). 2 October 2008. ^ "Greater Anglia Franchise Consultation January 2010" (PDF). Archived from the original (PDF) on 4 May 2011. "London & South East RUS (final)". Network Rail. 28 July 2011. p. 9. Archived from the original on 28 November 2017. Retrieved 28 November 2017. "Crossrail Act 2008". National Archives. Her Majesty’s Stationery Office. "Crossrail Bill supporting documents". Archived from the original on 13 February 2009. "Government backs £10bn Crossrail". BBC News. 20 June 2004. Geoghegan, Tom (20 June 2004). "Will Crossrail beat the Tube?". BBC News. "Crossrail link 'to get go-ahead'". BBC News. 13 February 2005. "First Crossrail bill for Commons". BBC News. 22 February 2005. "Election holds up Crossrail bill". BBC News. 7 April 2005. "Crossrail plan in Queen's Speech". BBC News. 17 May 2005. "Crossrail's giant tunnelling machines unveiled". BBC News. 2 January 2012. "Crossrail: A rare look deep under London" (video). BBC News. 25 January 2013. Retrieved 26 January 2013.